Turns out Gordon Brown had bigger things to worry about than that silly waxwork distraction of a few weeks ago, where an online poll of Tussauds fans gave the PM a big clunking thumbs down. Yet it must be galling to see other world leaders slip through the entranceway, like a better-tailored rival granted admittance to a trendy nightclub while you're standing outside fuming and fussing. Brown's Gallic counterpart, Nicolas Sarkozy, is the latest star at Tussauds. Positioned between George Bush and Tony Blair in the "world leaders" section, Mr. Sarkozy's model is all business, mobile phone clamped in hand and a look of serious insouciance screwed on his face. 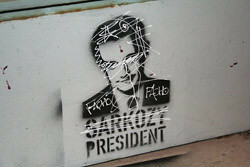 It caps a good week for Sarkozy, whose approval rating has jumped 5% and could mean, according to Figaro magazine, "the start of a sunnier patch" for the embattled Prez. Perhaps Brown can take comfort in another newly-elected leader not quite firing on all cylinders. Still, if Gordon's smarting from this snub, he can perhaps assuage his gloom with the news that he's not the only statesman to be maltreated by the Madame's minions. India's National Council for Civil Liberties has kicked up a stink after discovering that the waxwork of Mahatma Gandhi has been placed next to a dustbin on the second floor. Having once mingled with other leaders on the first floor, the removal of the "Father of the Nation" to a murky backwater has irked the NCCL's president V. K. Saxena, who, in a letter of complaint that's just a touch melodramatic, queried whether Gandhi's new home was demonstrative of a "racial bias" and a "demonstration of apartheid". Is Mr. Saxena talking cobblers? Dash off to Ahmenabad and tell him so - it's easier than ever to sort out an Indian visa, after all.